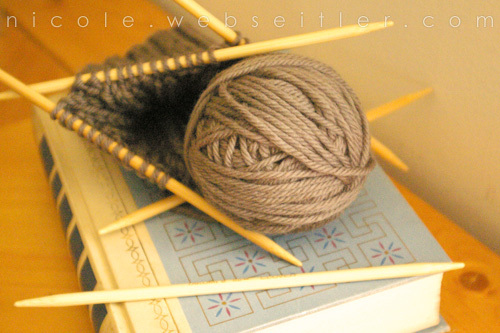 all the little stories» Blog Archive » happy socktober! It’s October! Time for Socktoberfest! My husband’s been bugging me for a warm and cozy pair of socks for almost two years now (ever since I knit a pair of socks for his dad for Christmas). I figured since I had the yarn, I’d better cast on! It’s the perfect time for it, huh? I’ve completed 22 rounds now. I’m past the “wrestling with a spider” stage of working with dpns and I’m starting to enjoy this project (especially since I now know how to knit Continentaly; a K2 P2 rib is fun!). My husband can’t wait. This entry was posted on Monday, October 15th, 2007 at 11:22 am and is filed under arts & crafts, knitting, linkage, photography, travis. You can follow any responses to this entry through the RSS 2.0 feed. You can leave a response, or trackback from your own site. That is a GORGEOUS shot. VERY professional. I really need to remember to watermark my photos when I post them. Argh.